In 1956, at the age of 19, I had finished aircraft maintenance tech school at Amarillo AFB in Texas. I was sent to Langley AFB in Virginia to the345th Bomb Group, 499th Bomb Squadron on B-57s. We were called the “Bats out of Hell”, and had that symbol on the end of the tip tanks. My commander was Major McCloud, and my first sergeant was Master Sergeant Richard Leake. In 1957 the 499th was sent to Simbach AFB in Germany as a practice to see how fast the squadron could set up to fly sorties. We flew in a C-124 from Langley AFB to Ernest Harmon AFB in Newfoundland. From there to Lajes AFB in the Azore Islands. From there we flew over France to Simbach AFB. The trip was very long, because the C-124 was slow (200 plus knots). We were over there 47 days, and then made the return flight back to Langley. In 1959, all four squadrons were sent to Kadena AFB in Okinawa. This was not a practice exercise. I thought it was to protect the Island of Formosa (now called Taiwan). We were at Kadena for 108 days TDY, and then the mission was ended and we returned to Langley. On the way over to Kadena, we stopped at various islands. 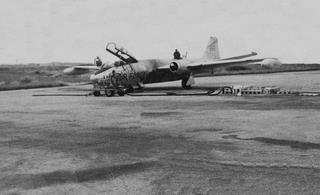 One in particular, was Kwajalein, and I had my picture taken while I was refueling a B-57 (picture above). I am sitting on the wing near the #2 engine. I have good memories of my experience with the B-57. I remember the ballistic starters that they had. The rotating bomb door, and the wide wing and long tail pipes. I remember having to get the landing gear pins from the pilot, and pinning the gear before the engines could be shut down. I also remember having to keep the fuselage by the #1 engine clean because of the starter blast. Now at 77 years of age, I am still reeling from the euphoria of having had the honor of working on the B-57, and being in the USAF.